Stopped by my LCS today, cuz I have been jonesing about hockey and the only cards in the retail stores are Score. When I sleepwalk I bid on wax boxes of Pinnacle. Bought the few packs UD Hockey they had left. Four hits in a box, but I only got one of them. Looks like Upper Deck is recycling relic swatches like A&G did this year. 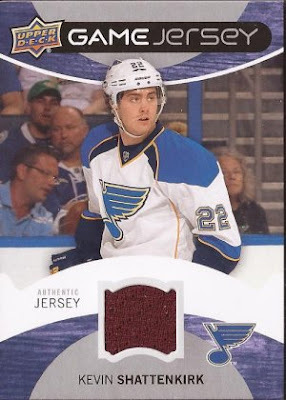 Shattenkirk last wore the burgundy of the Avalanche 20 months ago before he was traded to the Blues. He has 107 games played in a St. Louis sweater, Upper Deck. Ain't got one laying around?